The ZOA had been urging Northeastern to remedy the campus anti-Semitism. In a July 2013 letter to President Aoun, the ZOA detailed the anti-Semitic harassment and intimidation that Jewish students were being subjected to; the letter was based on interviews that ZOA conducted with almost 20 students, as well as with faculty and community members. 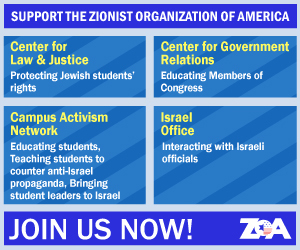 The Zionist Organization of America (ZOA) sent a letter yesterday to Dr. Joseph E. Aoun, the president of Northeastern University in Boston, MA, strongly praising Northeastern for promptly and appropriately disciplining the anti-Semitic student group that calls itself “Students for Justice in Palestine” (SJP). At the close of the SJP’s annual anti-Semitic “Israel Apartheid Week,” the SJP put fake “eviction notices” under students’ doors in several of Northeastern’s residence halls. These notices contained false and demonizing information about Israel, calculated to incite hatred of the Jewish State. The “eviction notices” were designed to look genuine, leading some students to believe that they were actually being evicted – during mid-terms. These actions, like previous actions of the SJP, caused alarm and even fear in students, especially Jewish students. Northeastern took strong and decisive action, suspending the anti-Semitic SJP for at least one year; permanently banning its current executive board members from serving on any future board in the organization; mandating training led by university administrators as a condition of reinstatement, and possibly imposing individual sanctions against at least two SJP students, including expulsion. The SJP has a history of engaging in a campaign of anti-Semitic harassment and intimidation on campus. Last year, the SJP disrupted a presentation by Israeli soldiers and was placed on probation. The SJP has a history of engaging in a campaign of anti-Semitic harassment and intimidation on campus. In addition to describing the anti-Semitic hostility, the ZOA proposed that Northeastern take several steps calculated to remedy the hostility. These included a recommendation that President Aoun publicly and forcefully condemn campus anti-Semitism, and that Northeastern enforce its Code of Conduct and hold Jew-haters accountable when Jewish students are threatened or harassed. Shortly thereafter, Northeastern began implementing these steps. In late October 2013, President Aoun gave his state of the university address. 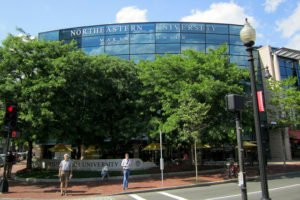 To an audience of thousands, Northeastern President Aoun publicly proclaimed, for the first time, that Northeastern would have “zero tolerance for anti-Semitism.” Then, in November 2013, Northeastern issued a written message to faculty that students must be able to express their views without fear of intimidation or reprisal.